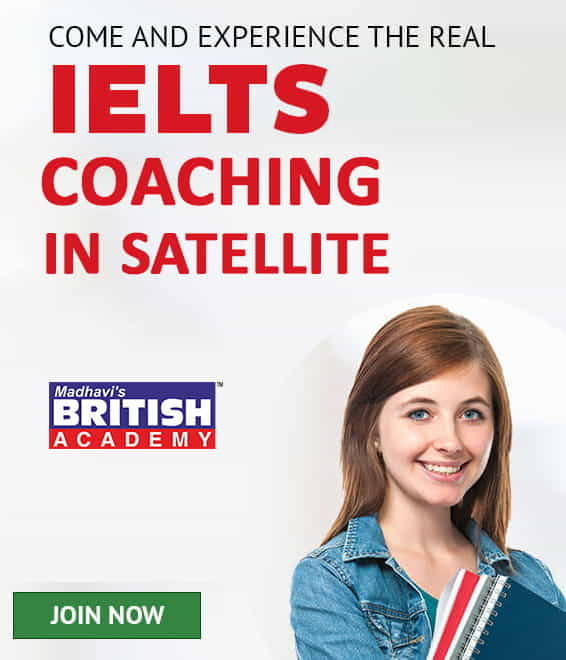 Why Best IELTS Coaching in Satellite? Satellite Top IELTS Coaching Classes - Commenced its Journey in the year 2000, today BRITISH ACADEMY is successful in establishing itself as leader in Spoken English. Also, British Academy has set strategies of Spoken English and Personality Development, IELTS, PTE, GRE and TOEFL. British Academy is # 1 Best IELTS coaching in Satellite, Ahmadabad, beside IELTS coaching and guidance, British Academy gives a higher selection rate every year in PTE, GRE, TOFEL. Many of the students join British Academy at Satellite having intention to improve their spoken English and for their personality development. Students join us in a great number because our English spoken and personality development programmed aims at communication which should be clear and effective; it helps students in the preparation of IELTS and other examinations additionally. We provide personalized attention and convenient timings so that every student could do IELTS preparation at their best. Beside Satellite, British Academy Best IELTS Coaching in Ahmedabad has its branches in Maninagar, Gurukul, C G Road, Nava Vadej, Science City Road, Anand.